Rarity/ Pinkie Pie its a tie! Yeah, then I am most pinkie pie, then Rarity! I had to dig though a few of my older posts but I found it! I was gonna post this a while ago actually but I kinda forgot . 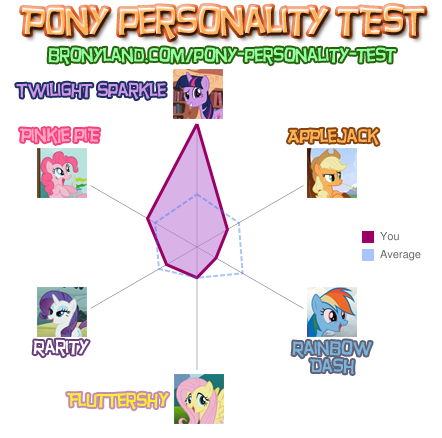 i am most like rainbow dash i even took a test for it. so someone try to find a picture. Made by the awesome Ehjookayted . I usually hate these types of tests because they're pretty inaccurate. Yes I'm most like RD, but NOTHING like Rarity, whatsoever. I'm a lot like Twilight as well, but I barely have any of her. And I'm almost nothing like Fluttershy, so that part is right. Well I am barely anything like AJ and she is apparently the pony I'm second most like. These tests are not always right but I would say most of the time they are. TAKE COVER SHE HAS A MUFFIN ROCKET LAUNCHER!!! Who cares about the glasses! Your avatar is wearing goggles! Goggles are seriously more awesome then sunglasses! They kinda look like Sam Fisher style goggles too! Splinter Cell meets MLP ? I might need to write a fan-fic about that!